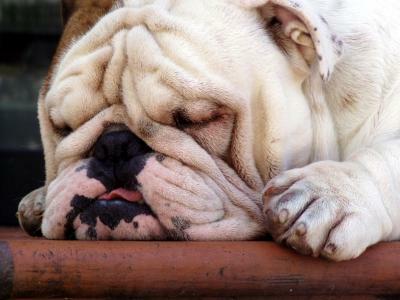 Bulldogs are prone to reverse sneezing. A bout of reverse sneezing in dogs can be very frightening for owners who don't understand what's happening to their pets. Find out what reverse sneezing really is and what you can do to help your dog when it happens. Understanding what's going on may remove some of the fear. You may already have witnessed a bout of reverse sneezing in your pet and not even realized it for what it was. A dog having a bout of reverse sneezing sounds like he is simultaneously gagging and struggling to breathe in air. The sound is akin to a long snort, but it sounds like the snort is drawn in rather than expelled. During one of these episodes, the dog will stand stiffly and hold his neck and head out and downward as he struggles to regain normal breathing. The episode is usually over within a few minutes, and then the dog is back to normal with no lasting ill effects. Here's the kicker; a reverse sneeze isn't a sneeze at all. It's actually a pharyngeal gag reflex. This is a spasm of the soft palate that is typically caused by some sort of irritant or other cause. During one of these spasms, the dog's airway becomes temporarily narrowed, and this makes it more difficult for him to breathe, although he is still able to take in some air. If your dog is having a soft palate spasm due to one of the causes listed above, you don't actually have to do anything but give your dog some time to recover on his own. However, it can be difficult to watch a dog struggle through one of these episodes, and it's natural to want to help him. If you can persuade your dog to swallow, this usually helps stop the spasms. You can do this in one of two ways. First, you can try gently stroking your dog's throat in a downward motion. If this doesn't encourage him to swallow, you can try placing your fingers over his nostrils for a second or two. Your dog's automatic reaction is to lick, and this is followed by a swallow. A couple of licks will usually resolve the situation, and then you can let go. It may take a few seconds more for your dog to fully recover, but this usually does the trick. There is another cause for these spasms that goes beyond the causes mentioned above. Many brachycephalic breeds are prone to having elongated soft palates, but other breeds, including toy breeds, can be affected. The soft palate's main job is to momentarily close off the airway when a dog swallows. This prevents solids and liquids from passing into the airway rather than traveling down the esophagus as they should. Brachycephalic dogs have rather round heads and very short muzzles. Due to this conformation, there's reduced space for the soft palate, and it tends to overlap the airway and sometimes obstruct breathing. In some serious cases, part of the soft palate must be surgically removed in order to preserve the airway and prevent its eventual collapse. Since you likely won't know what causes your dog's soft palate spasms the first time you witness an episode, it's a good idea to consult your vet about the incident and see if he feels it's worth an exam to determine the cause. If you happen to have one of the brachycephalic breeds, it's helpful to understand the extent of the elongated soft palate and whether your pet is a candidate for surgery to relieve the problem. On the other hand, you may be relieved to find that your dog doesn't have a serious condition, and you can learn to take these episodes in stride.